I first saw Gus Lascaris sometime around 1971 on the first day he moved his family onto Norwood Avenue across from our home. He strode in his stocking feet over his car starting from the trunk, over the roof, and onto the hood — jumping off like Zorba the Greek had just emerged from the screen and onto the pavement. In the background, the Lascaris home on Norwood Avenue, June 1973. 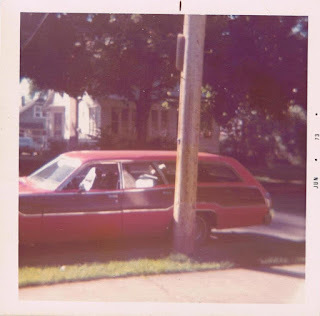 In the foreground, the Urso's brand new rally red 1973 Plymouth Satellite station wagon. I paused — I didn’t have a response. One, because I didn’t know I should have an opinion about my neighborhood; two, because no adult ever asked me for my opinion; and three, because no one ever called me Jack, but rather by the more juvenile “Jackie,” a name which I still rue to this day. In one simple sentence Gus Lascaris became my favorite adult. Plus, walking over a car was pretty freakin’ awesome to a six year old. Gus looked like a cross between Groucho Marx and Gabe Kaplan in Welcome Back, Kotter. He had a head of thick black hair, bushy eyebrows, and a full, fat mustache. A pair of black, horn-rimmed glasses completed the ensemble. Georgia, his ever-patient wife, was a classy, socially active lady cut from the same cloth as Eleanor Roosevelt — intelligent and concerned about others. In contrast to Gus’ anarchic antics, Georgia was a placid, cool presence. 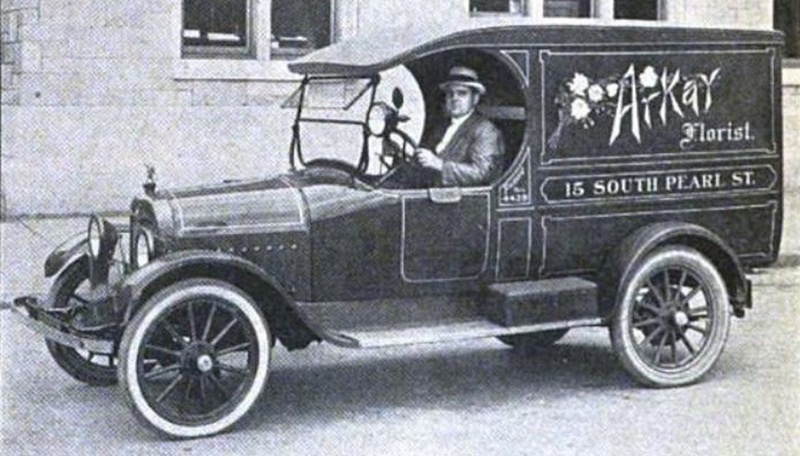 The Lascarises owned the Arkay Florist, a flower shop in downtown Albany, NY. The business was started by Gus’ family in 1910 and served countless state workers and politicians for nearly 100 years — with the Lascaris family in charge for 75 of those years. Gus’ family also included daughters Kiki, Pia, and Tina, and Yiayia (Greek for grandmother), Georgia’s solemn widowed mother perpetually dressed in black. Arkay Florist delivery truck, 1918 (Albany Group Archive). Gus was adept at establishing his own mystique. He boasted of being able to trace his family lineage back to the Spartan warrior caste in classical Greece — knowing full well that such a claim could not be proved to the descendants of Sicilian dirt farmers. When my mother related her family’s oral tradition of fleeing from the fall of Constantinople in 1453, and thus our own possible Greek heritage, Gus only scoffed and noted that his family didn’t flee the Turks. They stayed and fought while ours were growing zucchinis and stomping grapes in Sicily. Gus either had a basic distrust of authority or full confidence in the incompetence of others — probably a mix of the two. This manifested itself in a variety of ways. One time, when seated at a restaurant with our family, Gus abruptly stood up and without a word entered the kitchen. After a few minutes he returned to the table. As he sat down, my mother commented humorously that if he was looking for the bathroom he went in the wrong direction. Gus responded that he actually went into the kitchen to check things out. Mistrustful of the sanitary habits of the help, whenever he ate at a new restaurant Gus walked into the kitchen to inspect the premises. He would observe closely, make comments, and if anyone asked who he was he would tell them he was a health inspector. I’m not sure how often he got away with it, but there was a certain confident mojo about Gus that was both inspiring and intimidating. Another time, while cleaning up the Arkay Florist shop alongside my mother, I came across a large box under the counter filled with crumpled up pieces of paper I took for garbage. Gus went on to explain that he was audited nearly every year. An IRS agent would come into the shop and demand to see Gus’ books. Gus would pull out the box of receipts and say “Here are my books.” The poor agent, usually an unknowing rookie, would then have to spend the next few days going through Gus’ assorted jumble of paper only to find that things checked out. It was an almost annual tradition. “Why not just do your taxes yourself?” My mother asked. “I pay my taxes. I expect service.” Gus declared, knowing full well that if the IRS didn’t send someone he probably wouldn’t pay his taxes — or maybe he would when he got around to it . . . eventually. With such antics, Gus exposed the cracks in the system. Authority could be challenged, questioned, opposed, played for the fool, and have their knickers twisted in a bunch for no other reason than you’re bored and it amuses you. Our annual family Christmas party was often an opportunity for Gus to hold court. As the adults discussed work and mortgages, I sought out Gus for both his attention and approval. While the former was often attained, the latter was more elusive. When I showed Gus my new realistic-looking Bicentennial Commemorative musket I received as a gift one year, Gus angrily pushed the barrel away from his face when I showed it to him. “Never point a gun at anyone!” Gus yelled. I protested that it was only a toy gun, and the barrel blocked up, but Gus would hear none of it. “What you do with toy gun you’ll do with a real gun,” Gus noted ominously. Later in life, it was a lesson I would see play out when a when a young boy at my small religious school accidently killed his older brother while playing around with their father's unsecured hunting rifle. Gus' warning so intimidated me that it stills rings in my ears whenever I see a gun. At another Christmas party, I engaged Gus in a conversation about the metaphysical. As a Greek Orthodox Christian, he had a slightly different interpretation of the faith than we Catholics, and as Gus he had a slightly different take on just about everything. My mind was developing to the point I could ponder abstract concepts, so I asked Gus what he thought what God was really like. Gus, of course, like everyone else, did not know the answer; nevertheless, that did not stop him from coming up with one. “I am my own God,” Gus stated with the assurance that only comes from omniscient insight. “Oh Gus, please . . . it’s Christmas . . . he’s just a boy!” Georgia interrupted, unsuccessfully trying to rein him in. Gus went on to explain that we, and the world we live in, are the products of our own creation. We create our own happiness and our own misery. We’re each both God and the Devil. I wasn’t sure if my mind was being blown or if Gus was just bullshitting me. I discussed the conversation with my dad later and he paused, trying to explain the Gus Lascaris phenomenon. I didn’t know what that was exactly, but being able to create the world you want to live in was a compelling concept for a child who spent most of his time playing imaginary games. I began to understand a little bit about what Gus meant when he said he was his own god. Eventually, however, all gods die. I have no picture of Gus among the family photos. I recall there used to be one of him from our 1976 Christmas party — clad in an open-neck white oxford shirt, sitting cross-legged in our big green recliner and raising a glass of beer. I poured through hundreds of pictures and asked my brother and sister to search through any they may have had, but to no avail. I searched desperately for some kind of relic of Gus’ existence beyond just my limited and quickly fading memories. Gus and Georgia showed up to one more Christmas party in 1978 after my parents divorced. My mother moved us into a small row house she rented. The place was cramped and despite such features as central heating and air conditioning it had a run-down and impersonal feel. Our other neighbors from Norwood Avenue, the Allegrettis, also showed up and maybe one or two other adults. Their children stayed away — except for the young son of a cleaning lady who worked with my mother and who felt as out of place in my new home as I did. We were a small group sharing small talk and uncomfortable glances over half-filled paper plates. Quite unlike the annual Christmas parties of just a few years ago. As I sit in my study and write this, my feet lay on an old oriental-style rug. Back in December 1978, my mother bought it when we moved into our little row house. A bit of an extravagance, it was something to show our former neighbors that we were not yet defeated by our circumstances. I think about the old rug under my feet, the one my mother bought new nearly forty years ago. Gus walked on it during that last Christmas party. I shuffle my feet across the worn threads of the carpet imagining where Gus must have stood that cold, late December night so long ago. Memories are the elusive shadows of the past. The Gus I remember may be entirely different from who he truly was. I select the memories that stand out, focusing on broad brush strokes and forgetting the subtle details that more closely define who we are. Gus has been gone for three decades and already he has grown in my mind from a not-so-mild-mannered florist to an inscrutable guru of gregarious proportions of whom I am desperately seeking some evidence of his existence — like a holy relic. 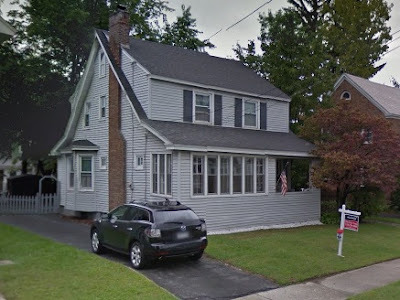 The former Lascaris home on Norwood Ave. circa 2013 — the family long since moved away. The huge maple tree is gone. Wood siding covered up by gray vinyl siding. Once again for sale. As what happens to old friends, time, tide, and distance eventually led us to part ways. The last time I saw Georgia was in the mid-1990s. A farmer’s market took place in a church parking lot across from my apartment every Saturday. One day, while sitting out on the front stoop, I saw Georgia pull up in her car. I hadn’t seen her in well over a decade and, now about 30, my appearance changed quite a bit. I approached and introduced myself. The surprise caused her to pause as it took her a moment to recognize me. We caught up on each other’s family. She was pleased to hear that my mother was now living with my sister, just as Yaiyai did with Georgia and Gus. Her mother, however, had long since passed away, as did Gus not long after retirement. I could tell in her eyes how much she missed that barely tethered ball of anarchic energy. Not knowing what else to say, an awkward silence hung in the air. We shared a few more pleasantries and then said our goodbyes as she turned towards the farmer's market. I sat back down on my stoop and watched as she made her way through the crowd and faded into the background, obscured from my sight.